· The distinct curly coat of the different Rex cats is due to spontaneously occurring mutant genes. · The various Rex breeds are distinct and were discovered and developed independently of each other. · Each Rex breed is named after the region in which they were discovered. 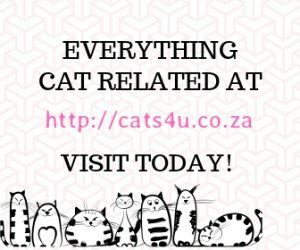 · The most famous are the Cornish Rex, Devon Rex and Selkirk Rex. · Rex cats have medium length compact muscular bodies with an arched back. · Their legs are long and straight. · The Cornish and Devon Rex cats have triangular heads while the Selkirk Rex have a rounded head. 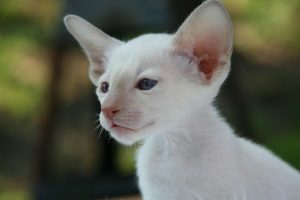 · The Cornish Rex cats have a long face and a long straight nose while the Devon Rex cats have prominent cheekbones and a shorter nose. 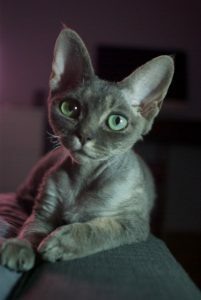 · Rex cats have large ears but the Devon Rex cats have particularly very large ears. · The eyes of the Rex cats are large and oval shaped with colours matching that of the coat. 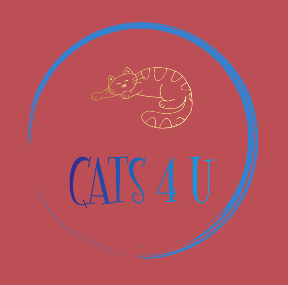 · The distinguishing feature of all Rex cats is their wavy coat pattern. · Cornish Rex coat is short with a curly undercoat that is fine, silky and close-fitting. They have no top coat or guard hairs. The coat form ripples on the back and tail. · Devon Rex coat is very short, fine and wavy. It is a silky undercoat with a few guard hairs. The hair strands are very delicate and are easily broken. · The Selkirk Rex has a coat that is thick and dense with lambswool texture. They have curled guard and awn hairs. 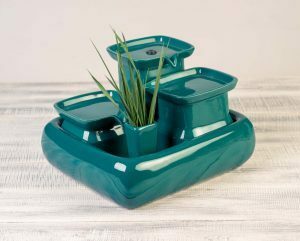 · Rex cats are active, agile and love going for a walk on a lead. · They readily form strong bonds with their owners. · The Cornish Rex is intelligent, thoughtful and active. · The Devon Rex is very playful and mischievous. · The Selkirk Rex is calm and affectionate but can be playful too. · A rubber brush is ideal for Rex cats because it does not scratch the skin. · The Cornish Rex needs gentle brushing and the fingers can be used to set the waves. · The Devon Rex fur is very delicate and breaks easily so they require very gentle stroking with a soft mitt rather than a brush. · The Selkirk Rex needs gentle regular grooming with a wide-toothed comb. · The name Rex is taken from a curly coated rabbit of the same name. · A “Rexed coat” of the Cornish and Devon Rex is produced by a recessive group of genes producing a mostly tightly curled, soft-textured coat. · A “Selkirk Rex Coat” is produced by a dominant gene which is the exception to the general Rex group producing a shaggy cat with a soft, plushy and curly coat.